Done? All right. In case you just skipped ahead, here’s a quick summary: a man is tied to a pole in a dim room, with tumbleweeds blowing by. You see him through the scope of a gun. You are instructed that you have a choice. If you press ESCAPE to quit, you’re informed that you have won. If you shoot the man, he dies, and you are informed that you have lost. And if you restart the game, the man is still dead. As Anthony Burch points out, “we as gamers know that our second chance, our extra try, is but a single quickload away.” If I want to find out what happens if I kill a Little Sister in Bioshock, I save my game, choose “kill” instead of “rescue,” and then restore my save once the cutscene is over. The choice has no permanent consequences. Even Rogue-likes, which maintain a “bones file” recording player death stats and don’t allow the restoration of a saved game after PC death, don’t really change in a fundamental way in response to player actions. But “Execution,” a piece with only one choice, records that choice in the registry, an arcane and frightening place that is a mystery to most of its players. And so your choices in your very first playthrough can change the game forever. In most video games, player agency extends only to one linear path through the game. The player’s choices only affect the game world if you choose to let them. There exist multiplayer “persistent world” games, but I don’t know of one that lets a player enact major change, presumably to avoid one player “ruining” another’s experience. However, in “Execution,” the player not only has the agency to affect her current playthrough, but every subsequent playthrough of the game. It’s unclear whether the player character is the same from one playthrough to the next — the piece is too simple to tell — but the fact that each playthrough definitively ends but affects the next is very unusual. The central choice is also interesting. It’s never told who the man tied to the post is, or why the player is aiming in his direction. From the title “Execution,” one can assume that he is being punished for something, but it is not obvious whether that punishment is unjust. From the fact that the player loses if she shoots the man, we can assume that the man’s execution is, at the very least, out of proportion with his supposed crimes. And that is an implied message of the game, as well: that death is a serious and permanent consequence of killing, and that the man’s death is a loss to his executioner. I’m sure I’ve complained in the past that our games are fixated on killing. An overwhelming majority of video games either revolve around killing large numbers of entities or revolve around a poorly-masked substitute for killing (what do you think happens to Goombas when you step on them, and how do Robotnik’s robots feel about the animals inside being freed?). The most striking thing about these deaths, beyond their prevalence, is their triviality. None of these deaths matter. They, for the most part, are either interchangeable cannon fodder or horrible evil bosses. Even in the games that offer a more ethically gray killing experience, one press of the “quickload” key will resurrect the dead. But in “Execution,” there is only one person to kill. He is defenseless. And once you pull the trigger, he will never come back. That is without a doubt the oddest game that I’ve ever played… and doubtlessly, the most thought-provoking. Thanks for recommending the second play-through. I disagree with what you’re trying to say with this, and that it presents some kind of pressing and important issue in games. Clearly this game is saying “killing is bad”, but it does it in such a blunt, forced and obvious way that it comes off as extremely ungraceful and unimportant. Does the “you win” or “you lose” text need to exist? What if the player in-game felt justified in killing this man? What if the man was a mass murderer? What if the man would’ve killed the player if given the chance? You willfully skip over all the important counter-points on the idea of killing and opt for the easy way out, making the game look childish in the process. Due to this the game also makes me feel like you’re just a bad game designer, and making the game have “an obvious artistic statement” is like a license for you’re games to be simple and incomplete. Furthermore, do gamers really need to think about the consequences of killing in such a blunt manner when it’s been covered in plenty of other games before yours? Shadow of Colossus has giant beasts, that when killed don’t come back, merely, they lie there, bodies decaying in the sun. Bioshock as you mentioned, does a similar thing with Little Sisters (regardless of if you harvest them or save them): Big Daddies wander around aimlessly, pounding on their hiding holes in fits of rage and sadness. The death of companion cube, and it’s inevitable destruction weighs heavily on the players mind, especially when GLaDOS sees fit to rub it in. Guy: First, I may have made it unclear, but “Execution” is not my piece. It was created by Jesse Venbrux. Next, I agree that the piece doesn’t present much of a narrative to contextualize the killing. We don’t have anything to go on within the work except the statement that killing the man means the player loses. Venbrux, in the discussion thread linked in the post, says, “This game is not a statement against or for anything, neither did I have the intention to spread a message.” I don’t think he was trying to make the statement that “killing is bad;” rather, he’s operating from that assumption. Where I think this title breaks new ground is in the permanence of the killing. In most games, your choices don’t have permanent consequences; you can always restore a saved game. 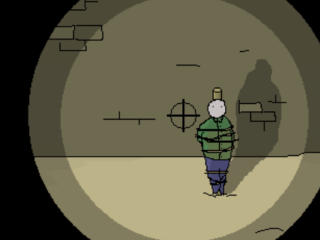 What Venbrux has done is make the man’s death as permanent to the player as it would be in the real world. It’s not an artistic statement. Everyone knows death is permanent (theological discussion aside). What he does is make a clever twist on the way the player views interaction. I agree that Shadow of the Colossus, Portal and Bioshock represent death more touchingly, but none of them incorporate the permanence of death into the player’s experience so directly.